Ratan Tata stepped down as chairman of the Tata Group in December 2012 after 21 years at the helm. The group is one of India’s biggest business conglomerates, with numerous interests including steel, cars, renewable energy, tea and hotels, and a major philanthropic donor. Mr Tata started with Tata Steel in 1962 on the factory floor. During his time as chairman, the Tata Group expanded from a predominantly Indian-focussed business to a global operation, including acquisition of European brands such as Tetley, Corus and Jaguar Land Rover. Mr Tata is a member of the Indian Prime Minister’s Council on Trade and Industry. He also sits on the advisory boards of Mitsubishi Corporation, JP Morgan Chase, Rolls-Royce, Temasek Holdings and the Monetary Authority of Singapore. He also serves on the board of trustees of Cornell University and the University of Southern California. 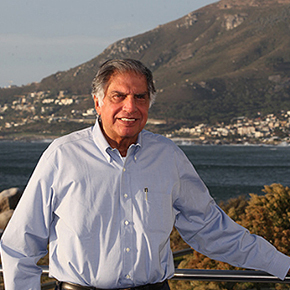 Ratan Tata has received numerous awards for business and philanthropy, including Business Leader of the Year in 2010 in the Asian Awards and a Lifetime Achievement Award for innovation by the Rockefeller Foundation in 2012. In 2009, he became a Knight Commander of the Order of the British Empire (KBE). Having graduated in architecture and engineering from Cornell University, Mr Tata holds honorary doctorates from Ohio State University, University of Warwick and University of New South Wales, as well as an honorary fellowship from the London School of Economics. He continues to chair the two main Tata charitable trusts.